It's not always easy to find party-going, prom-suitable styles for short or medium-length hair. But it is possible to dress up your cropped hair for a glamorous night on the town. Three words are going to be vital to the success of your short up-do: products, accessories, and creativity. If your hair is long enough, you can pile it on top leaving random tendrils to fall around your face. Or pull it up to the top of your head and dress it with a fashionable ribbon. If it's quite short, you can style it upwards to the crown or brush it into quiff hairstyle. If you like to have multiple styling options with your short hair then you need to choose the right hair cut. For example longer layers throughout the top and having a bang allow you to transfer your everyday casual look to a glam updo with few styling products. With the right hair cut you should be able to achieve at least three different looks -Texture, Slick and Retro. Here is a great funky twist top knot up-do created by top Italian stylist Egidio Borri for those who like something different and edgy. Many runway models wear it. The look is trendy, fun and not as hard to create as it appears. Hair accessories serve a dual purpose of holding your hair in place and adorning it. So why not use bejeweled hair combs, hairpins and barrettes to add a dash of color and sparkle? For example, try pulling medium-length hair softly to the back and twisting it into a bun at the nape of the neck, secured with a fancy hair stick. 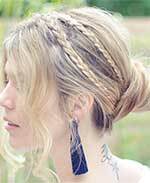 Here some tips to dress up your hair with or without accessories! Whatever type of hair bling you select, it should be carefully chosen to complement the outfit and any other baubles you’ll be wearing that night. Another great example on how a simple chin-length bob (top left) styled into a twist updo. The products you use will help you discover a texture that creates a distinct look that's true to your own hair. For unruly curly hair, always start with a smoothing product to prevent frizz and then complete your style with finishing products. Fast-drying non-aerosol hairsprays and dry shampoo and hair powders are ideal for manageability; they secure your style and help the hair feel soft and natural. Fine short hair also needs special products to help achieve and maintain an up-do. Use an extra strength gel, putty or molding clay to give your strands extreme volume. Then manipulate them into the shapes you desire. You can upload up to 4 hair styles images. Share your look and styling tips. To embed a video from social websites like YouTube, just cut and paste the code or enter the link to page and we activate it for you. A sweet formal style in golden blond for short hair with longer bangs styled to a soft quiff and hair been brushed back through the sides. How to achieve up-dos or prom do's with shorter hair.